It wasn’t enough for M. Night Shyamalan and Will Smith to create a sci-fi film. For After Earth, they patterned an entirely new world history (or at least paid some really geeky people to do it for them). Nova Prime looks a lot like Utah (because it’s filmed in Utah), and that’s where the story starts. Smith plays Cypher Rage, a general in a military unit called the Rangers, while his real-life son Jaden plays his fictional son Kitai. The younger Rage aspires to follow in his father’s footsteps and join the Rangers. When an errant asteroid damages their ship, it causes them to crash-land on the most inhospitable planet in the universe — Earth. Separated during the crash, Kitai must battle his way across an aggressive and deadly planet to reach his injured father, who is in bad shape. The journey will take Kitai through jungle, desert, forest and probably a few Shyamalanesque plot twists. I’ve spent a good chunk of the last two weeks surrounded by spreadsheets, crumpled paper packets, cartons of dairy products and dirty ramekins. Josef Centeno has a lot to answer for. A couple of weeks ago I stopped in at his Bäco Mercat restaurant downtown for a lunch that ended with one of the best panna cottas I’ve ever had. You know what I mean: Delicately sweet, it was like a dream of cream held together by faith and just a little bit of gelatin. It struck me — how long had it been since I’d had panna cotta? A few years ago you couldn’t go anywhere without seeing it. Then just as suddenly it went away. It makes no sense. A good panna cotta is as good as dessert gets. Vowing I would never again leave my panna cotta cravings to the whims of restaurant fashion, I determined to master the dish. If the plane crashes nose-first then sit in the back (but not all the way back). For a new documentary, the Discovery Channel took a Boeing 727 to a remote part of the Mexican desert and had it crash to examine what exactly happens in an emergency situation. It didn’t go well for the plane. The fuselage of the 727 actually broke in two. The cockpit and front seats actually folded under the back half. 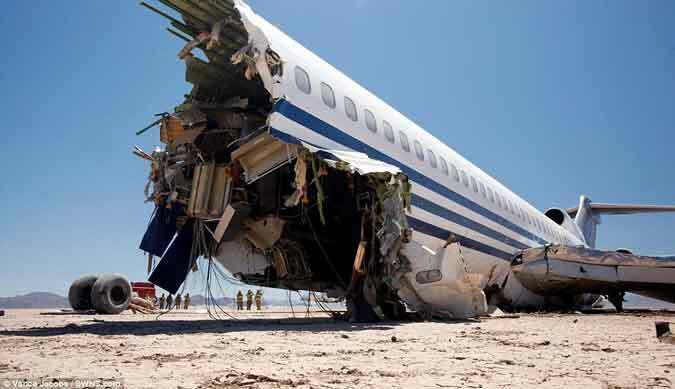 The plane, which was thankfully full of crash dummies, was being controlled remotely to make for a fairly realistic crash. The pilot that flew it from take-off had ejected just moments before. This is the first full crash test of an airplane in these conditions since NASA’s 1984 test crash in California’s Mojave Desert.